AmCham EU/Center for Transatlantic Relations Transatlantic Economy 2017 report is an annual survey of jobs, trade and investment between the United States and Europe that was published by the Center for Transatlantic Relations Johns Hopkins University, Paul H. Nitze School of Advanced International Studies and in cooperation with AmCham EU. America’s combined asset base in Poland, Hungary, and the Czech Republic (roughly $140 billion) was larger than its asset base in India ($121 billion). In 2014 the UK, France and Germany accounted for 48% of U.S. affiliate manufacturing employment in Europe. In 1990 they accounted for 67%. Meanwhile, the combined share of U.S. affiliate manufacturing employment in Poland, the Czech Republic and Hungary jumped from virtually zero in 1990 to nearly 11% in 2014, indicative of the eastern spread of U.S. European operations. 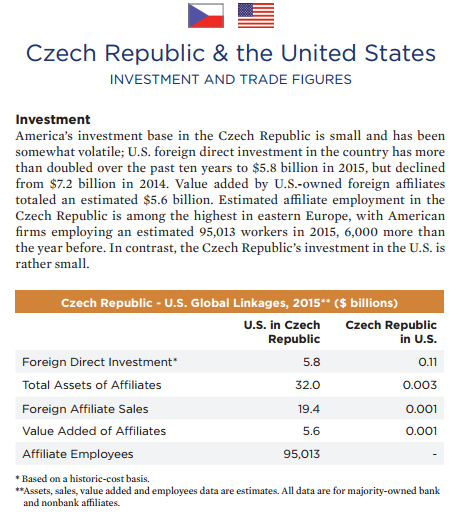 U.S. foreign direct investment in the Czech Republic has more than doubled over the past ten years to $5.8 billion in 2015, but declined from $7.2 billion in 2014. Estimated affiliate employment in the Czech Republic is among the highest in eastern Europe, with American firms employing an estimated 95,013 workers in 2015, 6,000 more than the year before. The Czech Republic has 1.2% share of European app economy jobs (19,700 app economy jobs), the 2017 Transatlantic Economy report says. Compare with the 2016 report. 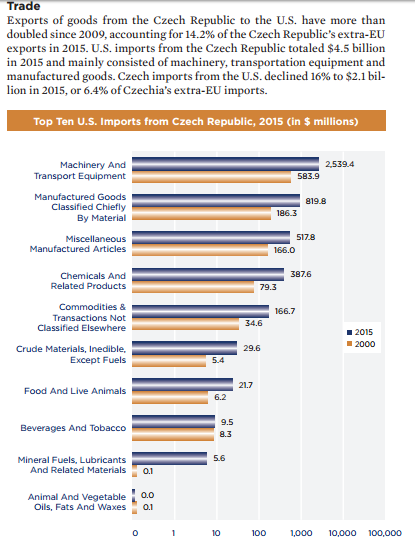 U.S. foreign direct investment in the Czech Republic totaled $7.2 billion in 2014. Value added by U.S.-owned foreign affiliates totaled an estimated $5.7 billion. Estimated affiliate employment in the Czech Republic is among the highest in eastern Europe, with American firms employing an estimated 86,904 workers in 2014, double the number of employees in 2000. Back to the 2017 report, generally, the transatlantic economy generates $5.5 trillion in total commercial sales a year and employs up to 15 million workers in mutually “onshored” jobs on both sides of the Atlantic. Together the U.S. and Europe accounted for only 27% of global exports and 31% of global imports in 2015. But together they accounted for 66% of the outward stock and 57% of the inward stock of global FDI. Moreover, each partner has built up the great majority of that stock in the other economy. Mutual investment in the North Atlantic space is very large, dwarfs trade, and has become essential to U.S. and European jobs and prosperity. 70% of total U.S. FDI outflows globally went to Europe in 2016. Only 21% went to the Asia-Pacific region. Within Europe, U.S. FDI is becoming more concentrated. In the first nine months of 2016, five nations accounted for nearly 95% of total U.S. FDI outflows of $162 billion to Europe. The five nations in ranked order: the Netherlands, attracting $42.1 billion and 26.0% of total flows to Europe; the UK ($35.1 billion and 21.6% of the total); Ireland ($31.3 billion and 19.3%), Luxembourg ($29.7 billion and 18.3%); and Switzerland ($15.6 billion and 9.6%). In 2015, these five nations also accounted for over 90% total U.S. FDI outflows to Europe. Europe accounted for roughly 70% of the $3.1 trillion invested in the United States in 2015 on a historic cost basis. billion), the Netherlands ($283 billion), Switzerland ($258 billion), Germany ($255 billion), and France ($234 billion). export destination after the EU. U.S.-UK trade is significant. But the real driver of the British-American economy is investment. In 2015, U.S. foreign direct investment in the UK totaled a record $593.0 billion and UK foreign direct investment in the U.S. totaled $483.8 billion. Estimated sales of American affiliates in the UK and British affiliates in the U.S. totaled more than $1.3 trillion. The UK accounted for 22% of overall global U.S. assets outside the United States. U.S. affiliates employ almost 1.4 million workers in the UK while UK affiliates employ roughly 1.1 million Americans. British firms were the #1 source of onshored jobs in 25 of the 50 U.S. states in 2014.